I was having way too much sake that night. At a noisy izakaya (居酒屋) on a Tokyo backstreet, my friend Yuji and I kept refilling each other’s cups. After we graduated from college, Yuji moved back to Japan and I to Toronto. Clinking cups with him that night took us back to the days when we used to do silly things together. I quaffed another shot of the potent junmai-shu sake (純米酒) and blurted out: “You and I, let’s climb Mount Fuji tomorrow.” It was the alcohol talking. That’s how it all started, 15 years ago – on a dare. Hours later and still nursing our hangover, we boarded the earliest bus from Tokyo to Kawaguchi-ko (河口湖), the most popular starting point for the climb. 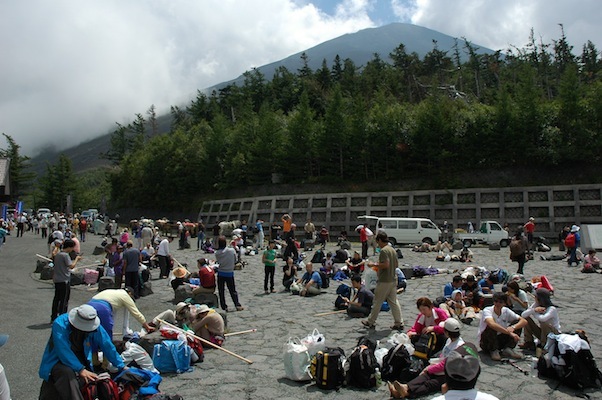 Mount Fuji is divided into ten “stations” from base to summit, and there at the fifth station base camp we found hordes of climbers warming up for their ascent and stuffing supplies into their backpacks. All Yuji and I had were our windbreakers and baseball caps. It was like bringing a pocket knife to a gunfight. Neither of us knew anything about a climb that was about to turn into a near-death experience. 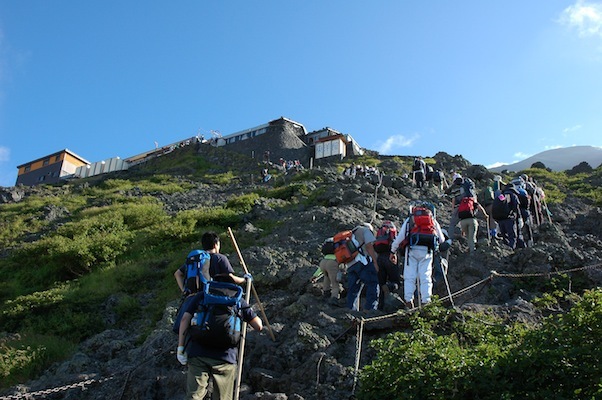 Going up Mount Fuji requires neither mountaineering gear nor experience. Along the way we saw children and their grandparents strolling about as if it was a family day at the park. The wholesomeness of it all gave us a false sense of security. What we didn’t know was that everyone except us had a winter jacket, a raincoat and a flashlight tucked neatly inside their outdoor backpacks, ready to be deployed should the weather suddenly turn. What we also didn’t know was that we could have easily died from hypothermia if we had taken our trip a few weeks earlier when it was still snowing at the summit. It took us seven hours to get to the top. At the tenth station, we were greeted by a torii gate (鳥居) and breathtaking views of lakes and valleys beneath the clouds. Our hangover and exhaustion gave way to awe and euphoria. With drifting clouds and red rocks at our feet, even the icy wind chill couldn’t dampen our spirits. We walked along the crater rim, like astronauts exploring an alien planet. At the very tip of the ancient volcano, it was where Mother Nature met Father Time, and where beauty blended with mythology. As if time goes by faster at high altitudes, the sun began to set after we had barely completed the crater circuit. “We must go now,” Yuji warned with uncharacteristic sternness. Whoever told us that the descent took only two hours had lied, for we were still somewhere between the eighth and the seventh stations when the moon came out. Without a flashlight, we had to negotiate the treacherous sand trail in complete darkness. We took off our jackets so that our white T-shirts would catch a bit of moonlight. And whenever the trail began to narrow, we got down on all fours and began to crawl. One wrong step and we would have fallen over the cliff. To lighten things up, Yuji told me that only four people died climbing Mount Fuji every year. Cold comfort. For a good hour, we screamed “tasukete” (助けて; help) like a pair of lost puppies, until we ran into an old couple and followed them all the way back to base camp. Before Yuji had a chance to answer, the old man started to chuckle and his wife offered us a drink of water. To this date, I’ve never told my parents what really happened 15 years ago and how close they were to getting a sombre call from Japanese police. They say what doesn’t kill you makes you stronger. Five years after my follies with Yuji, I was ready to do it again. I needed company, so I lured Wally, a friend from Los Angeles, with riveting tales from my first climb. I had him at tasukete. Learning from past mistakes, I packed a headlamp, compass and waterproof clothing. Remembering the last scene from Titanic, I even threw in a safety whistle for good measure. Wally had his heart set on watching the sunrise and our plan was to spend the night at a mountain hut near the eighth station. So there I was, once again at the Kawaguchi-ko base camp where it all began. From there to our lodge lay the same dreary uphill slog that Yuji and I had once ground out like foot soldiers in battle. At the hut, Wally and I wolfed down our curry katsu and went straight to bed – a thin tatami in a spartan wood shack shared with dozens of strangers. Between the thunderous chorus of snoring men and our throbbing headaches from the thin alpine air, we didn’t sleep a wink. At 2:30 am, the house staff banged their gongs and woke everybody up: it was time to head to the summit. We fell into line with hundreds of other groggy climbers, forming a long procession of headlamps that snaked around the mountain like Christmas lights. The thermometer on my trekking watch registered minus two degrees Celsius. I was shivering despite having two layers of fleece and a down jacket. But I was a happy camper compared to Wally. Not 50 metres from the hut, he started to vomit and lose his balance, sure signs of altitude sickness. Unable to continue, he reluctantly decided to return to the hut. There, we used a combination of simple English and sign language to plead with the staff to let us rest for a few hours before making our way down. Descending the mountain was the only certain cure for altitude sickness. I set my alarm for 4:30 am to watch the sunrise from the hut. At 3,100 metres above sea level, I had a front row seat for nature’s daily magic show. As blue turned into lilac and lilac into a mélange of pink, red and orange, all the gems in the world wouldn’t add up to the image before my eyes. Without warning, the breaking sun fired shards of light into the horizon and poured gold on everything it touched: the trees, the rocks and the morning fog wafting from the distant valleys. I turned around and saw Wally sound asleep next to me, snoring like a grizzly bear. I knew then he was all right. 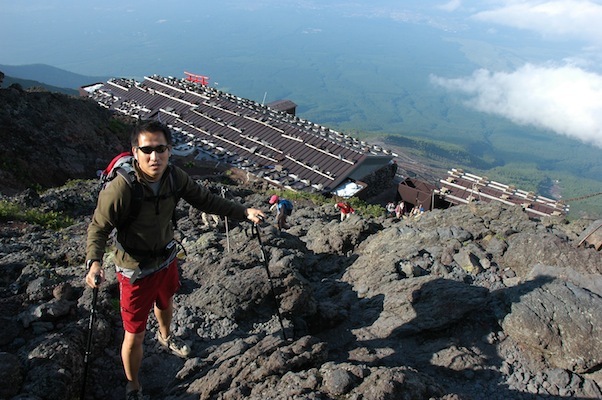 A glutton for punishment, I decided to climb Mount Fuji for the third time in July last year. 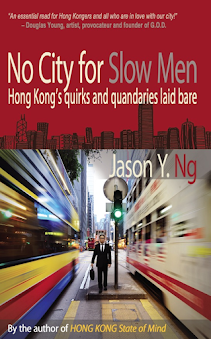 This time, I went with Jack, a Tokyo-born Taiwanese-American determined to get to the summit come hell or high water. It was early in the climbing season and there was still snow on the trail. Soon after we began our trek, it started to drizzle and the drizzle quickly turned into a downpour. The weather continued to deteriorate. By the time we arrived at the seventh station, we had thrown on every piece of clothing we brought with us. At the summit, snow and hail pattered our faces and the bracing wind was strong enough to lift us off the ground. Visibility dropped to a few meters. Jack agreed to skip the crater and we began our descent. With only our headlamps to show the way, we spent the next four hours braving the torrential rain and trudging down the muddy and perilously slippery trail. At base camp, we learned the last bus back to Tokyo had just left. That’s not what two exhausted, soaked-to-the-bone and mentally drained climbers wanted to hear. Using his fluent Japanese, Jack begged the keeper of a souvenir store to take us in. After half an hour of head tilting and eyebrow furrowing, the keeper let us hire an attic room. He even offered us a warm meal and a hot bath. Gratitude didn’t begin to describe how we felt, and I gave the kind man more 90-degree bows than I had given anyone. 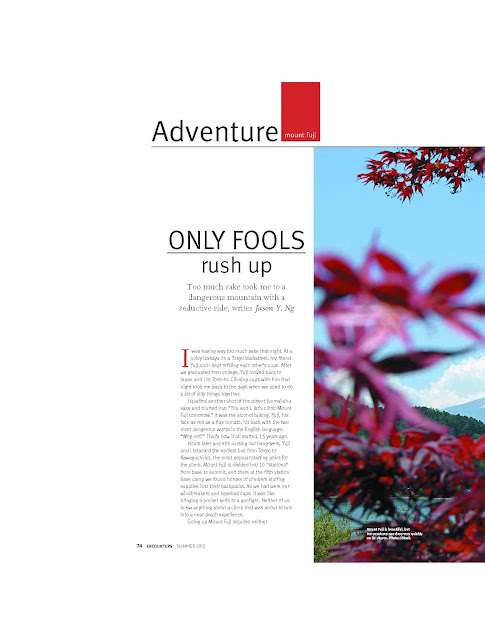 “A wise man climbs Mount Fuji once, but only a fool does it twice.” So goes the famous Japanese saying. On that account I must be hopelessly foolish. After three climbs, I am itching to go back. A fourth trip has been scheduled for summer next year. To this fool, climbing Mount Fuji has gone from a one-off challenge to a lifelong pursuit. It has leapfrogged sightseeing status into pilgrimage. That iconic volcanic cone of perfect symmetry, that ultimate embodiment of grace and understated beauty, is an endless source of adventure, exhilaration, trepidation and sadomasochistic thrills. Its perils and vagaries are its very allure. 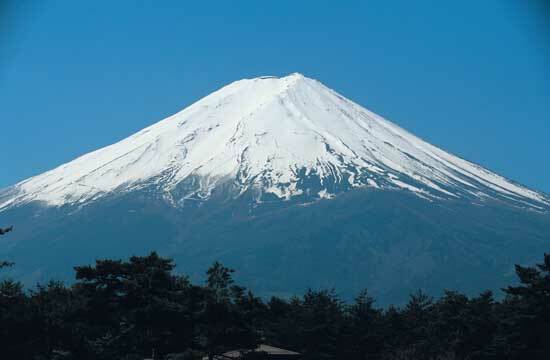 Mount Fuji may look harmless but it demands to be treated with respect. And the only way to pay respect to such a mountain is to climb it, over and over again. How to get there – Take the Keio bus (¥2,600, HK$255) from the west exit of the Shinjuku (新宿) train station directly to the Kawaguchi-ko fifth station. There are three buses in the morning and three in the afternoon. The ride takes 2½ hours. Where to stay – There are dozens of mountain huts along the trail that host overnight climbers. 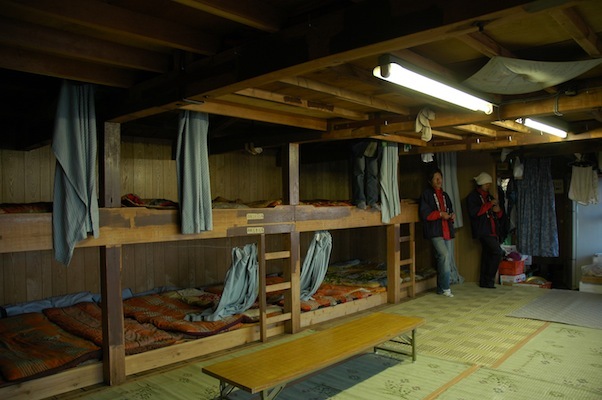 For a list of huts by location, visit http://live-fuji.jp/fuji/scott/huts.html. Reservations are not necessary but recommended. What to take – Be prepared for all weather conditions and err on the side of caution. Trekking boots, raingear (top and bottom), extra layers of warm clothing, gloves, headlamps/flashlights, hats, sun-block and a basic first aid kit. Although more expensive, snacks and water can be purchased at one of Kawaguchi-ko gift shops and from mountain huts along the trail. 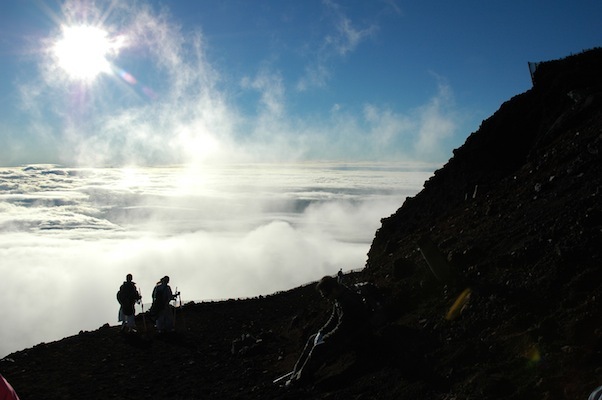 Further information – Japan-guide.com posts helpful, up-to-date information about climbing Mount Fuji. Visit www.japan-guide.com/e/e6901.html. 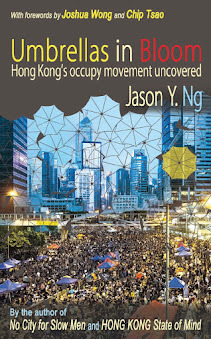 This article was published in the June issue of The South China Morning Post's Encounter magazine.